Our Singapore fridge repair technicians explains that a lot of electronic devices are used a lot in this modern society: this includes the refrigerators. They are electronic devices used to store food through the regulation of their temperatures and pressure levels. Most businesses, as well as households, tend to use them, in businesses they are used to store meat products, drinks, and ice cream while as in domestic setting they are used also to store foods and drinks. A refrigerator is made up of different parts; these include the compressor, condenser, filter or the dryer, expansion valve, evaporator, accumulator, refrigerator-fan motor and the freezer-fan motor. The compressor is one of the main components of a refrigerator, it is found in the bottom area at the back of the fridge and is driven by an electric motor. It affects the refrigeration cycle by pumping refrigerant air at high pressure to the different components of the refrigerator. The condenser is a copper coil found at the back of the fridge and has fans placed above it. It acts as a heat exchanger. The condenser cools the refrigerant; as the refrigerant passes through the compressor, it absorbs a lot of heat. Therefore, the condenser cools this gas using atmospheric air till it loses the heat. Filter or dryer, it is a part of the refrigerator which is the absorbent of moisture, iron particles and dirt. It protects the compressor by absorbing these impurities. It filters the dust from the refrigerant and the metal particles. It also removes moisture from the refrigerator using moisture absorbent materials that it contains. A refrigerator also has a component called the expansion valve. It is made of copper and takes the shape of a tube. The refrigerant that passes through it undergoes drops in the pressure and temperatures. It, therefore, helps to control the pressure and temperatures of the refrigerants that flow into the evaporator by separating the high pressure from the low pressure in an air conditioning system. The expansion valve is used in the refrigeration appliances. The evaporator is another essential part of a refrigerator; it absorbs heat from the substances and the foods stored to be cooled hence providing cooling for the fridge. It is an aluminium tube that contains aluminium fins. The evaporator transfers the heat it absorbs in the freezing and refrigerating compartments to the condenser. The accumulator is a tank-like part used to store the refrigerant, therefore, acts as its tank. It is used to prevent coolant starvation by ensuring that the evaporator does not run out of it. That helps to ensure that the refrigeration cycle does not stop. Refrigerator-fan motor is also a part of the refrigerator found at the evaporator’s back. It distributes air into the refrigerating and freezing compartments as well as blowing air into the freezer coils. 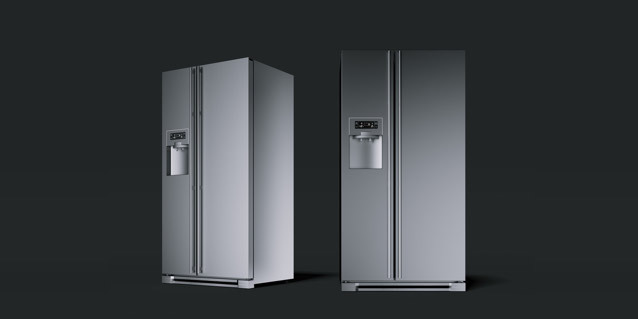 Due to the small size of the freezer area compared to that of the refrigerator, it is, therefore, easy to control and maintain its temperatures at some degrees below the 0 centigrade. The freezer-fan motor is also an important part of the refrigerator found beside the compressor. Its primary function is to ensure that the compressor stays cool as it has a fan that runs together with the compressor. Maintenance should be taken to avoid the bending of the fan since it can lead to a breakdown. The refrigerator also has some non-technical components such as the thermostat control which helps to set the required temperatures in a fridge using a knob. Proper setting of temperatures can contribute to avoiding the misuse of electricity. It also, the crisper which holds and stores fruits and vegetables. The refrigerator door compartment and the switch are also parts of the fridge. A refrigerator should, therefore, be maintained properly to avoid technical breakdowns which might cause a lot of destruction to both the areas of the refrigerator but also make the food stored go bad. It, therefore, requires a lot of high maintenance which also involves ensuring that it is clean to ensure that the food does not get contaminated. Unfortunately, it is powered by electricity, and sudden blackout may cause the food to go bad. However, some refrigerators save energy to ensure that in the case of a blackout it can properly store food for a couple of hours.